Now that they have permission to play the Egypt Game, it doesn’t seem as interesting to sixth graders April and Melanie. After some consideration, they decide it might be more exciting to shift their focus to gypsies instead. The trouble is, before the Gypsy Game can truly get underway, real-world problems intervene. Toby, one of the Egyptians, has run away, supposedly to avoid being kidnapped by his gypsy grandparents. April, Melanie, and their friends do their best to remain loyal to their friend while also satisfying the questions and concerns raised by the adults in their lives who are concerned about Toby’s well-being. Though there are 30 years between the publication date of The Egypt Game and the release of The Gypsy Game, in this fictional universe, it is literally as though no time has passed at all. The second book picks up just where the first one leaves off, filling in the very next line of dialogue. By the end of the first page, the reader is once again completely immersed in April and Melanie’s worlds - both the real one, and the one they imagine. For me, the time between books was only a couple of weeks, so I can’t say for sure whether the ease with which I slipped into the second story is a credit to the author, or simply a benefit of reading the books one right after the other. Still, I felt a strong connection to the setting - and to each of the kids - perhaps even more so than I did in their first story. Though real-world conflicts do encroach upon the Egyptians’ game in the first book, I think the problem presented in the second one is more pressing on the characters because this time they know the situation and the danger Toby might be in. The fact that the kids do have some information about Toby that they conceal from adults creates a sense of tension and suspense that keeps the story moving forward quickly, with many questions and answers following one after the other. I felt more strongly invested in the characters this time because they were much more invested in the real-world happenings around them, and not just in their make-believe. The politically incorrect use of the term “gypsy” may pose a problem, but I think a little coaching from adults can help kids understand why this word is no longer used, and why it is more appropriate to refer to this group as “Roma.” The use of “gypsy” in the title of the book and throughout the story is actually not used in an offensive way. The storyline itself works in many details about how the Roma people have been treated throughout history, and when the characters are well-informed, they do develop a stronger sense of respect that informs their plans for the Gypsy Game. The only thing I truly questioned was whether it was necessary for Toby to claim he is a gypsy, because it doesn’t seem to add much to the story, and it kind of makes him into a token character, especially because we learn nothing of his racial background in the first book. Similarly, the homeless characters in the story are treated very stereotypically, with little to differentiate them from each other, or to develop them as characters rather than just a collection of homeless people inserted to further a plot. Overall, I enjoyed this book, especially on the heels of The Egypt Game. 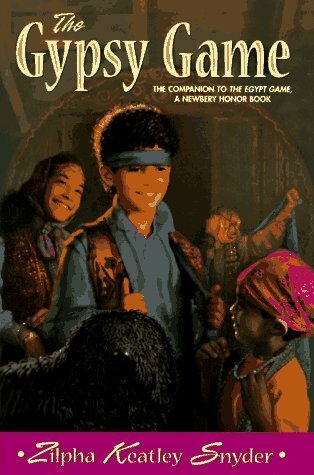 The Egypt Game is the superior story, and I don’t necessarily think readers will miss out if they never read The Gypsy Game, but it is nice to revisit the same characters and see where else the author’s imagination can take them. There is a bit of a cheesy Lassie moment where a dog is able to lead the kids to Toby’s location, which seems totally unbelievable and out of place, but there are just as many really lovely moments, including Marshall beginning to outgrow his need for Security, his stuffed octopus, and all the kids sneaking out to bring food to Toby while he is in hiding. If you’re a fan of the first book, it’s worth checking out the second, especially if you go in with no expectations and simply enjoy the story.